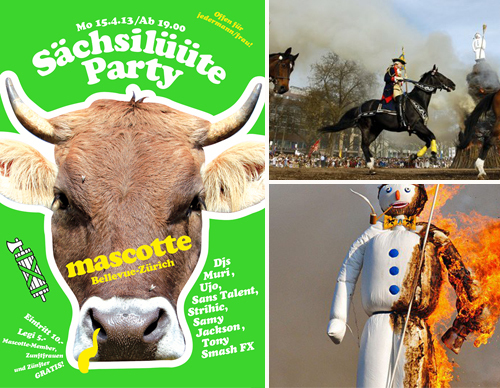 When you see a lot of traditionally dressed up people around town tomorrow afternoon (15 April), you know it’s Sächsilüüte. But, what is it all about? Old times come alive: At 2pm, there is a procession with all the different Zurich guilds around the city centre. Men, women, children, horses and even camels show their best sides to the watchers. But it’s only after the official part, when the biggest fun starts: the “real Zürcher” begin to approach when the Böögg is burnt down and there is a fire to grill your Servelat. At night, the guilds will be celebrating at their traditional guild houses and by paying visits to eachother. All others can enjoy a party night – for instance at Mascotte.